Diyar Al Muharraq, one of the biggest urban development companies in the Kingdom of Bahrain, welcomed a visiting delegation from the Council of Representatives, headed by the Speaker of the Council His Excellency Mr. Ahmed Ibrahim Al Mulla, on Thursday the 3rd of December 2015. The visiting delegation was welcomed upon arrival to Diyar Al Muharraq by the Chairman Mr. Abdulhakeem Alkhayyat, the Managing Director Mr. Aaref Hejres and the Chief Executive Officer Dr. Maher Al Shaer as well as other senior officials who accompanied the delegation on a familiarization tour to Dragon Mall, and the Warehouse Area within Dragon City, which is due to open its doors to the public before the end of December 2015. H.E Mr. Ahmed Ibrahim Al Mulla extended his sincere thanks and appreciation to Diyar Al Muharraq officials for creating such a grand destination that will positively impact the national economy through trade and tourism activities and also for providing more choices of merchandise for the people of Bahrain at very competitive prices for both retail and wholesale customers. 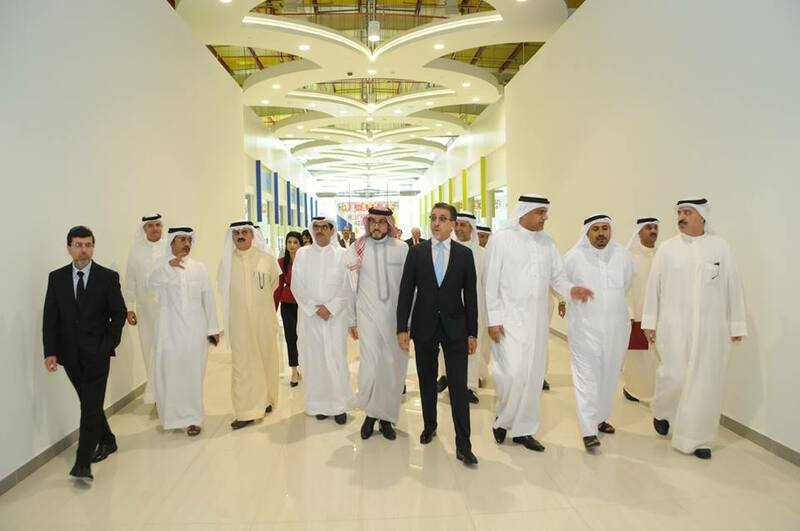 “Dragon City once opened will surely stimulate the kingdom’s retail, wholesale, export, leisure and tourism sectors creating more employment and business opportunities for Bahraini citizens, and will continue to do so for many years into the future. In fact it is set to attract visitors from all over the region, the benefits of which will spill over to enhance a variety of commercial sectors in the Kingdom” he added. “Dragon city is an indication of the achievements of Diyar Al Muharraq as we look to become a vital player in the Kingdom’s economic developments. I am certain that we are taking the right steps towards achieving our goals, which is to develop the country into a world class commercial destination,” he concluded. Spread over a total land area of 115,000 square meters, Dragon City is the first of its kind development in Bahrain, which will offer unique wholesale and retail opportunities to local consumers, trade customers and tourists. Dragon City encompasses Dragon Mall and a themed “Asian Dining Village.” The Mall Design is infused with Chinese architectural and cultural aspects incorporating over 747 individual retail and wholesale stores and additionally, a 4,500 square meter area designated for warehouses. The Asian Dining Village spans a land area of 6000 square meters and a car park large enough to accommodate 1,500 cars. To date, Dragon City has obtained 100% lease and the occupancy rate has reached more than 95%. Additionally, Dragon City also includes Dragon Apartments in close proximity to Dragon Mall. Occupying a total land area of 20,000 square meters, Dragon Apartments comprise of 6 multi-storey residential buildings encompassing both 4 and 6 floors with a total of 300 apartments and are seen to be the ideal residence for those invested in Dragon Mall and for those working in the Mall. Work on Dragon Apartments is totally complete and the first group of residents is due to move in their apartments soon. The Dragon City concept was launched in May 2012 as the result of an agreement between Diyar Al Muharraq and Chinamex and Cluttons was appointed as the leasing agent for the project in the Kingdom of Bahrain. Diyar Al Muharraq commissioned Nass Contracting for the construction of Dragon City and with work on the prestigious project having commenced in June 2014, it was completed well within target and now awaits imminent inauguration. Also, an agreement was signed with Bin Faqeeh Real Estate Development Company for the development of Dragon Apartments, and Banz Group was appointed for Warehouse Management and Logistics Services for Dragon City.